The hubs and I are bird nerds. He’s a wildlife photographer; I just look at the birds and take field notes. Even in wintery weather, the birds are out there to be seen. 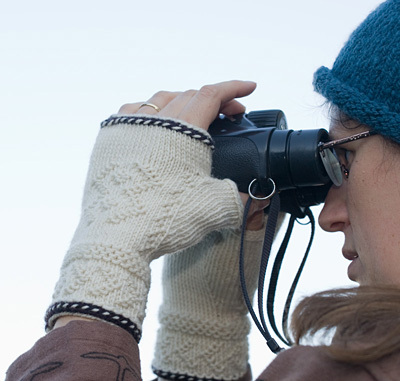 How will we stay warm while fiddling with camera settings and binoculars? 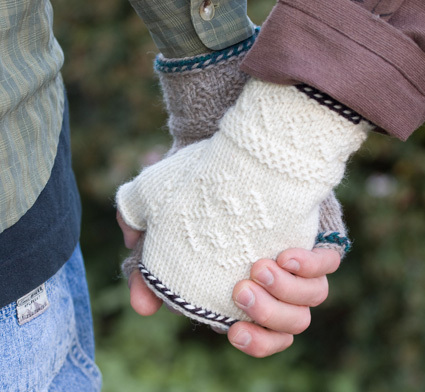 Enter Larus and Ardea, wind- and water-resistant twined half-mitts in natural colors for him and white for me. Hey, twined knitting worked for all those Swedish farmers in the 1800’s, and they had real cold to deal with! 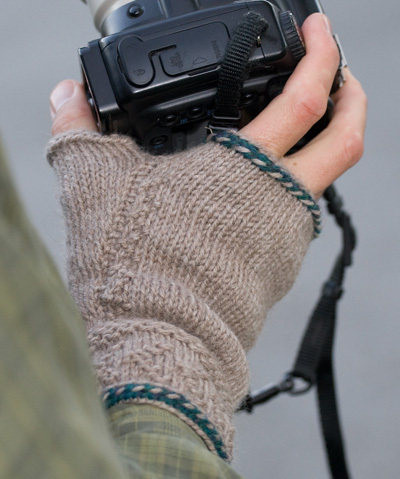 Twined knitting may be new to most Knitty readers, but these enticing mitts for men or women will keep you interested in learning new techniques. Larus and Ardea include a three-strand cast-on, twined purl, crook stitch patterns, and chain paths as well as straight twined knitting. And you’ll love the outcome – twined knit fabric wears like iron. My first pair have logged 15 years of field use and are still going strong! Twined knitting goes by the Swedish term "Tvåändsstickning", which is translated more literally as "two-end knitting". 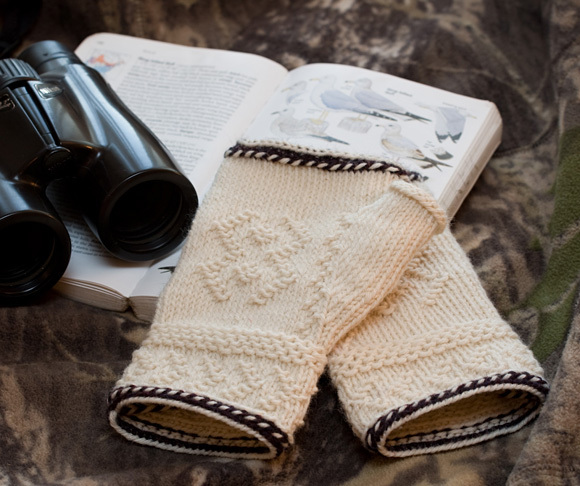 The name "twined" emphasizes the twist between each stitch that makes Tvåändsstickning different from other stranded knitting techniques. The twists build an additional layer of thickness behind the surface of the work, making twined knitting firmer, more windproof, and more durable than stockinette. But wait, there’s more! Using one strand in the front of the work and one strand behind, you can create three-dimensional surface designs. Twined knitting is usually worked as a “thrown” technique with the yarn in the right hand. Don’t let that hold you back if you are a “picker” – you just need to come up with a hand motion that allows you to twist the two strands before every stitch. Remember the nerd thing? Larus is named for the mottled brown of immature Western Gulls (genus Larus). Ardea comes from the white plumage of the Great Egret (genus Ardea). Note: Larus and Ardea are designed to fit exactly to the measurement of your hand. Choose a size that will fit snugly. Note: Yarn is worked more tightly than recommended gauge to produce a firm fabric. Twined knitting: Twined knitting is a folk knitting technique from Scandinavia. The Winter 2005 Knitty article “Twined knitting” is a great introduction to this technique. For every “twined knit” stitch, remember to bring the back strand over the front strand. For this project, use the twined knitting technique throughout, except where otherwise noted. This means you will twine the cast-on round, the increases, the pickup for the thumb, and the bind off. Twined purl: To work a single purl st surrounded by knit sts, simply bring the strand to be used to the front, purl as usual, and return the strand to the back of the work. To work a full twined purl round, bring both strands to the front. Purl every st, alternating the two strands. Always pick up the strand farthest from the tip of the needle (the back strand) and bring it under the front strand before working the stitch. A row of twined purl worked in two colors forms a two-color twist on the surface of the work. Twined increase: To increase in twined knitting, simply work the specified stitch twice. In twined knit, k up to the st where the increase will take place and work a twined knit st and but do not draw the loop through; bring the second strand forward over the first strand and k the st again; draw both loops through; one st increased. Cont in patt after the inc.
Crook stitches: Surface patterns featuring a strand of yarn left at the front of the work for a knit between two purl stitches are called crook stitches (Swedish: krokmaskor). To work a crook st, bring one strand to the front and p the next st as normal; drop the purl strand and leave it at the front of the work; using the other strand, work a knit st; drop this strand and return to the strand waiting at the front. purl the next st on the front side and bring the front strand to the back of the work to continue twined knitting as usual. The inactive strand will lie at the front, on top of the knit stitch, between the two purl sts. Clever placement of this 3-st combination – twined p, “crook knit”, twined p – forms raised designs. Crook round: A crook round is worked by alternating knit and purl sts, working as in the crook stitch technique, leaving the strand just used at the front after each purl st. Explained a different way, you're leaving the inactive strand at the front when working the knit stitch. (Swedish: krokvarv). There is one crook round at the bottom of each mitt. Chain path: A “chain path” (Swedish: kjedjegång) is two or more complete crook rounds. A chain path requires an odd number of stitches so that the front-side strands of the second round will fall above the purl bumps of the first round, making the links of the chain. Managing twist: Cascade 220 is plied (twisted) in the S direction. The motion of twined knitting also twists in the S direction, which will add twist to the yarn, compressing it a bit and tightening the strands. In a small project like these mitts, the twist won’t affect the quality of the yarn too much. But there is a second aspect of twist, which will be significant. If you are using both the inside and outside strands from a center-pull ball, the two strands will become twisted – hopelessly twisted, if you work too far without releasing the twist. To save your sanity, stop occasionally and use your free double-pointed needle to pin the strands to the ball; hold one strand in each hand and let the ball twirl in the air to spin the extra twist out. You can also use a spare needle to limit how far the twist can go while you are knitting. Pull out a length of both strands; stick the spare needle through the ball and wind a few inches of yarn around this “pin” in a figure 8. Working mitts on dpns: To keep track of which part of the hand you are working, it is helpful to know where the middle of the round is. Try to divide the work so that half the stitches are on the first two needles and the remaining half are on the last two needles (if using 5 dpns) or the last needle (if using 4.) This helps when thinking about where the gusset decoration and back-of-hand motif will be worked. The markers for the thumb increases will be on two different needles in this setup. Please note: Charts B and C show the placement of crook stitches, using a ~ between two Os to represent a strand carried across the surface of the work. It may help to review the explanation of crook stitches [above] before working this chart. Back-of-hand patterning is optional; see picture of Larus [brown version] below for a non-patterned example. Leaving a tail of approx 12 inches if you plan to braid the cast-on strands, hold two strands of MC and one strand of CC together; make a slip knot to begin the CO – this slip knot is not counted as a stitch. Use all three strands in the CO, holding CC in the left hand and the two strands of MC in the right hand. Place the slip knot on a double-pointed needle and form a loop of CC around the left thumb; pick up the thumb loop with tip of the needle; use one of the strands of MC to work a twined knit stitch; drop the loop off the thumb and snug the stitch to the needle, 1 st CO. Cont in this manner, alternating the two strands of MC between each st CO. Always bring the back strand over the front strand as usual for twined knitting. Repeat twined CO until you have 60[66, 72] sts. Remove the slip knot and join for working in the round. Round 1: With a single strand of CC, k all sts (without twining). Round 2: Using one strand of MC and one strand of CC, work one round of twined purl, starting with MC and alternating MC and CC every other st. End by taking both strands to the back of the work. Drop CC. Round 3: Using two strands of MC, work one crook round: [p1 twined, k1 with the inactive strand in front], rep to end. Be sure to start with p1 so that the front-side strands cover the CC sts from Round 2. Bring the front side strand to the back at the end of the round. From here, you'll continue with two strands of MC. Rounds 4-5: Work twined knit. Round 6: [P1 twined leaving the yarn in front, crook k1, p1 twined, k3 twined] rep to end. Round 7: [K1 twined, p1 twined leaving the yarn in front, crook k1, p1 twined, k2 twined] rep to end. Round 8: [K2 twined, p1 twined leaving the yarn in front, crook k1, p1 twined, k1 twined] rep to end. Round 9: [K3 twined, p1 twined leaving the yarn in front, crook k1, p1 twined] rep to end. Round 11: As per round 7. Round 12: As per round 6. Round 13 Work twined knit. Round 14: Work twined knit to last 2 sts, k2tog. 59[65, 71] sts. Round 15: Using two strands of MC, work a crook round: [p1 with the inactive strand in back, k1 with the inactive strand in front], rep to end. This forms a chain path: because of the odd number of sts, the knits will line up above the purls in the second round. One strand remains at the front of the work throughout these four rows. Rounds 16-18: Repeat Round 15. Round 19: Work in twined knit and dec 5 st evenly around. 54[60, 66] sts. Round 20: Start gusset decoration: K22[25, 28], work row 1 of Chart A, pm, k2 (you have reached the middle of the round), k2 on the next needle, pm, k25[28, 31] to end of round. Rounds 21-23: Work as established for 3 more rounds, following Chart A, slipping markers when you get to them. This gusset decoration places twined purl sts against a background of twined knit sts, for a decorative effect. This is not the same as crook sts. Round 24: Thumb increase round: Continuing Chart A decoration as established, work to first marker, slip marker, inc 1 in the next st, k to one st before second marker, inc 1 in the next stitch, slip marker, work to end of round. Round 25: Cont Chart A and work even. Round 26: K2[2, 3]; work row 1 of Chart B[Chart C, Chart C]; k3[2, 4]; work Chart A over the next 3 sts; work thumb incs as established between markers; work even to end. Cont as established, working hand patterning chart, Chart A, and the thumb incs every other round, until there are 18[20, 24] sts between markers. Next round, discontinue thumb incs and work 8[8, 9] more rounds, cont hand patterning and Chart A as established. For size S and L, you will complete the hand patterning chart before you finish the 8 or 9 rows without increases. At that point, work the back of the hand in twined knit until it is time to set aside the thumb sts. Next round: Continuing with the last row of Chart C for size M only, work to the first marker and place the next 18[20, 24] sts onto a stitch holder or piece of waste yarn; using backwards loop cast-on and alt two strands of MC, CO 6[6, 6] sts to bridge the gap; work to end of round. 56 [62, 68] sts. Work in twined knit for 7[8, 8] rounds above the thumb. Finishing round 1:, Using one strand of CC only, k all sts (without twining). Finishing round 2: Work one round of twined purl using one strand each of CC and MC. Finishing round 3: Using one strand of CC, decrease evenly around as follows: [k3, ssk, k3, k2tog] repeat to final 1[2,3] sts, k1[2, 3]. Finishing round 4: Using both strands of MC and twining as usual, BO all sts knitwise. Using two strands of MC and twining between all sts, pick up 8 sts ove the cast-on sts (including one stitch in each of the two corners) and put the 18 [20, 24] thumb sts back on the needles (26 [28, 32] sts). Work in the round, starting with the thumb sts from waste yarn.. Round 1: K17[19, 21] twined, ssk, k5 twined, k2tog, borrowing the second st of the k2tog from the first needle of the next round. Beginning of round moves one st to the left 24[26, 30] sts. Round 2: K all sts twined. Round 3: K,15,[17, 19] twined, ssk, k5 twined, k2 tog, again borrowing the last st of the round from the next needle. 22[24, 28] sts. Round 4: K all sts twined. Round 5: Work one row of twined purl. P with both strands in front, picking up the back strand under the front strand for each st. Round 6: BO all sts in twined knit. Reverse the patterning on Rounds 6-12,	if desired, so the chevrons point the other direction. Round 6: [K3 twined, p1 twined leaving the yarn in front, crook k1, p1 twined] rep to end. Round 7: [K2 twined, p1 twined leaving the yarn in front, crook k1, p1 twined, k1 twined] rep to end. Round 8: [K1 twined, p1 twined leaving the yarn in front, crook k1, p1 twined, k2 twined] rep to end. Round 9: [P1 twined leaving the yarn in front, crook k1, p1 twined, k3 twined] rep to end. Continue as for RIGHT HAND up to Round 20. Continue with RIGHT HAND instructions until Round 26. Cont as established, working thumb incs every other round, Chart A and hand patterning chart, until there are 18[20, 24] sts between markers. 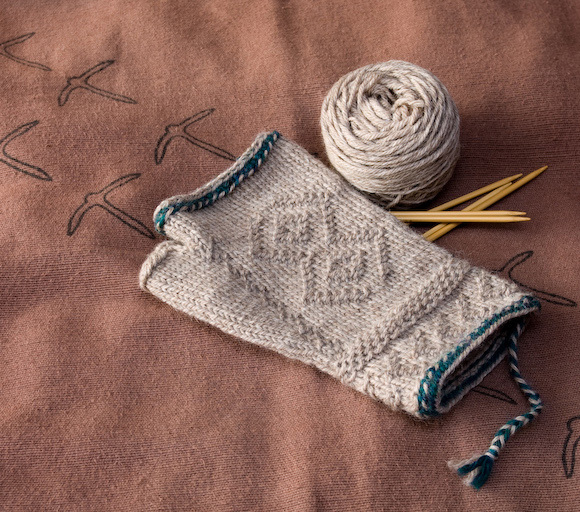 Once the location of the pattern is established, you can finish the mitt following the charts and instructions as for RIGHT HAND. You can make cute, dangly braids at the cast-on edge, if desired. Try it! They have an ethnic knitting look and when do you ever have four strands to mess with? To work a four-strand braid, line up the colors with the two light strands inside the two dark strands, as D1-L-L-D2. STEP 2: Cross leftmost strand (the same color as the strand in Step 1) over two strands towards the center: L-D2-D1-L.
Repeat these two moves (right strand over one, left strand over two) until the braid reaches desired length, approximately 3.5 to 4 inches. Tie a knot to end the braid and trim to an even end. “Techniques with Theresa - Twined Knitting”, by Theresa Vinson Stenersen. Knitty, Winter 2005. “Tvåändstickning: Sweden’s Two-End Knitting” by Nancy Bush. Piecework, Jan/Feb 2007. Spinnity spins, birds, and knits in the SF Bay Area. She has a bad habit of combining hobbies “in the field”, which sometimes leads to muddy knitting projects and broken dpns. Half the members of her spinning group have already published patterns in Knitty. Spinnity’s just trying not to wreck the curve.